Welcome to week 4 of the Handbuilt Holiday series! 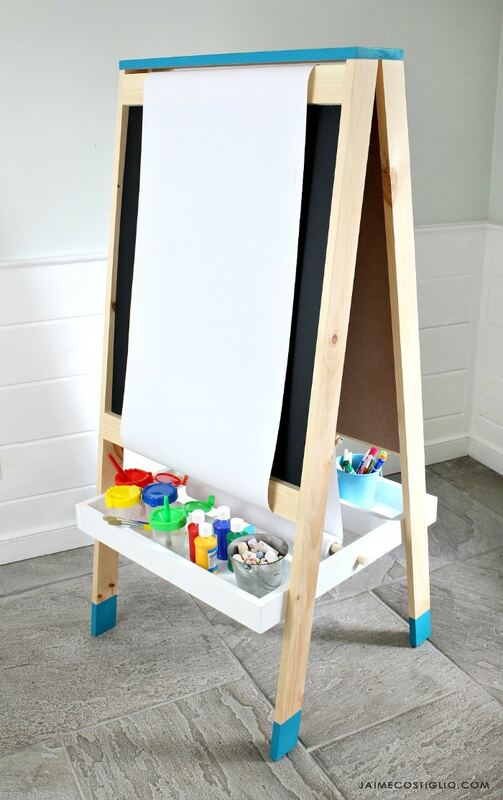 Today Ana and I are sharing an easel for kids complete with blackboard, whiteboard, paper roll storage and open trays for easy access. 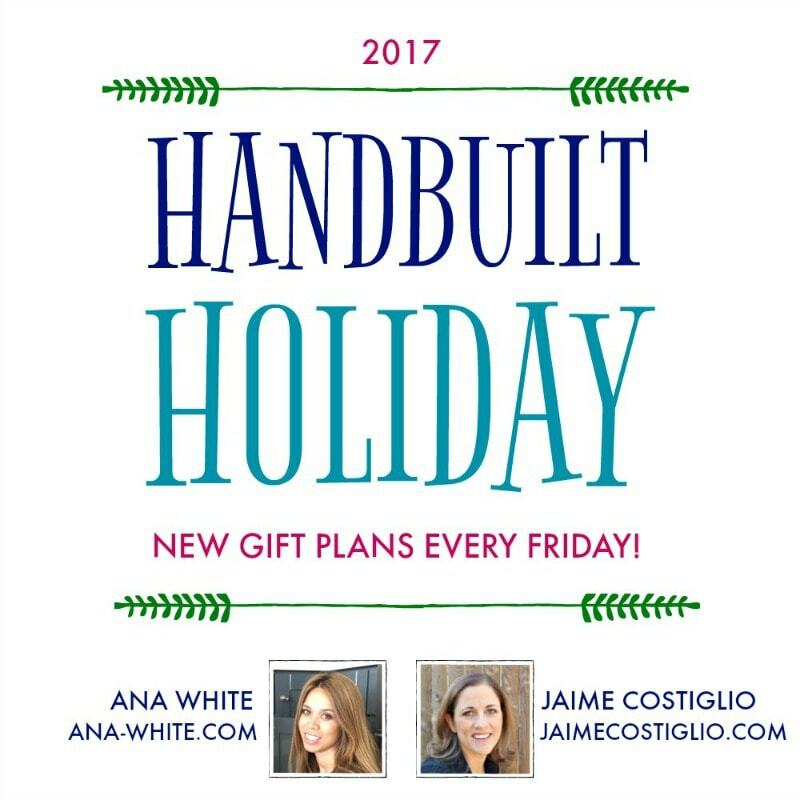 If you’re new here let me explain a tiny bit, Ana White and I post a new gift build plan every Friday leading up to Christmas. 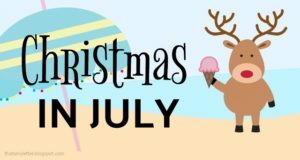 We always start 12 weeks out from Christmas in order to bring you 12 different gift project ideas. As we get closer to the holiday the builds will get more simple and easier. This is our 5th year doing the Handbuilt Holiday series and we enjoy every minute of sharing these projects with our readers. 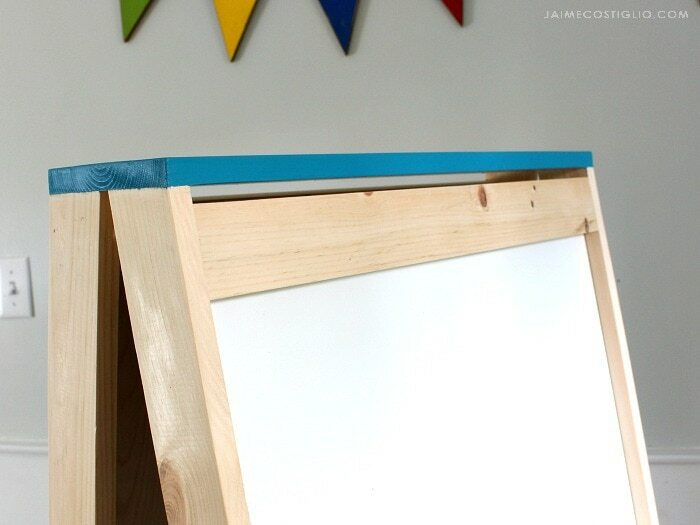 Last week we shared a modern house shaped desk but if you’re looking for something a bit younger and more versatile then maybe consider this easel for kids. Ana designed the plans to include every bell and whistle you might need for those creative kids. Bonus tip! 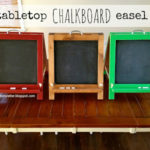 You can purchase the plywood panels for the chalkboard and whiteboard already coated, so basically that part is done for you and it’s just a matter of simple construction. 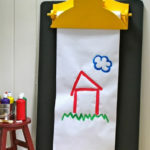 Ana has the plans for the easel for kids here. Be sure to read through entirely before beginning and scroll down below for a few building notes. 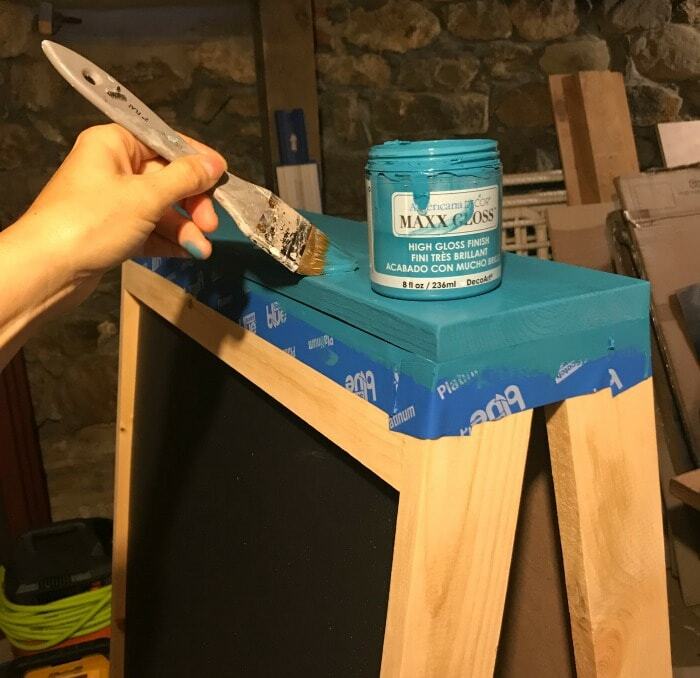 Once the frame is built consider painting the storage tray before attaching. I opted to use DecoArt Americana Decor Maxx Gloss in caribbean sea on the top and bottom portion of the legs. By painting the bottom of the legs you create a visual for kids which prevents tripping. 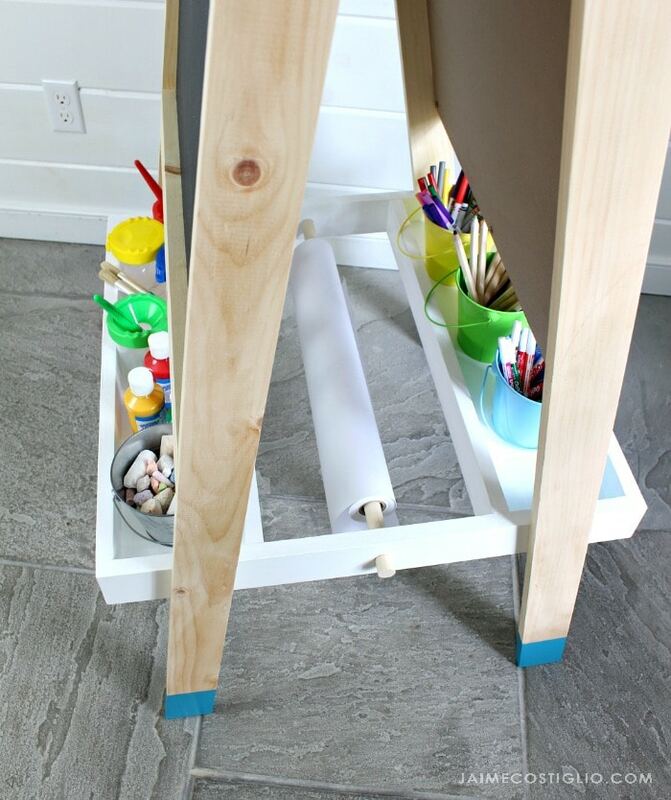 Also the storage tray is painted in Maxx Gloss white china, it’s a super durable hard finish which is resistant to cleaning chemicals, perfect for all those messy kids. I also suggest not painting the paper roll dowel which will make it much easier to insert and remove to change the paper roll. 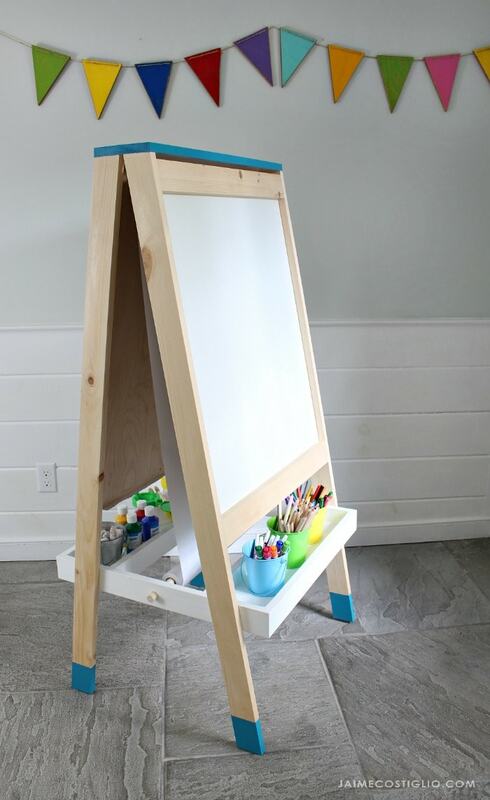 You could even make this easel with 2 paper roll holders, one for each side which would be really convenient. Above is a detail photo of the slot at the top of each board which allows the paper to pass through. 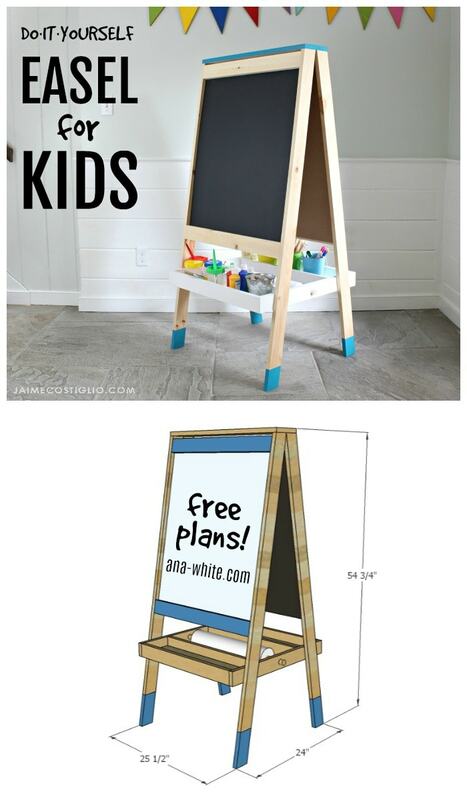 I hope you have the perfect little someone in mind who would love an easel. Please share your builds by tagging us on social media, we love to see what readers are making and your creative twists! Sure wish there was a ‘print’ button! 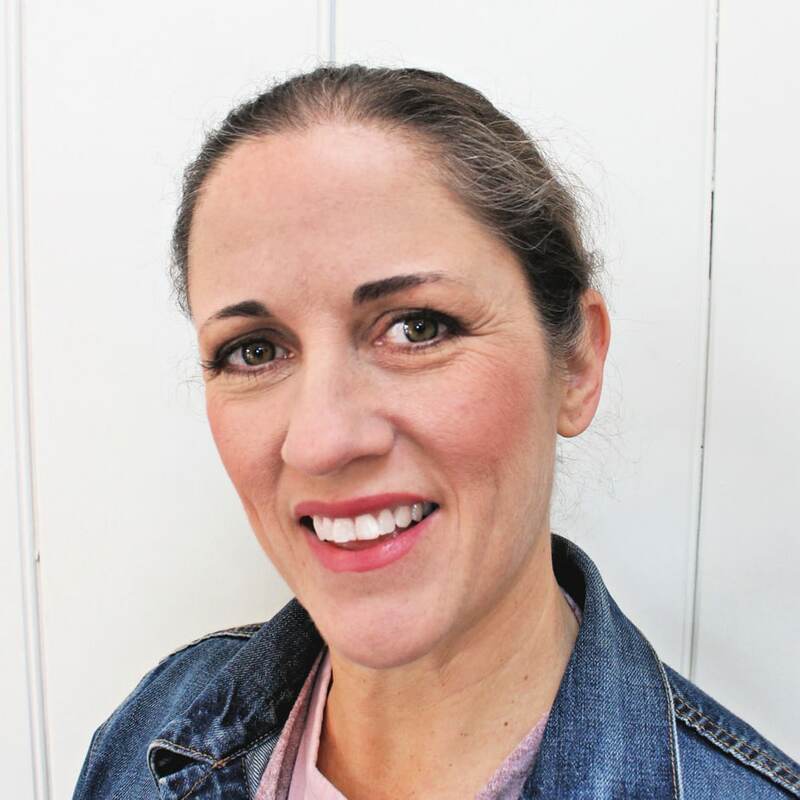 Hi Patty, there is a printer friendly version of the plans on Ana’s site. Scroll down towards the bottom of the post and it says ‘printer friendly’ or click here http://www.ana-white.com/print/33063 Hope that helps. 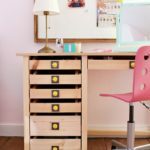 This is great and I can’t wait to build this for my daughter. One quick question, though…where did you get the white and chalk board panels? 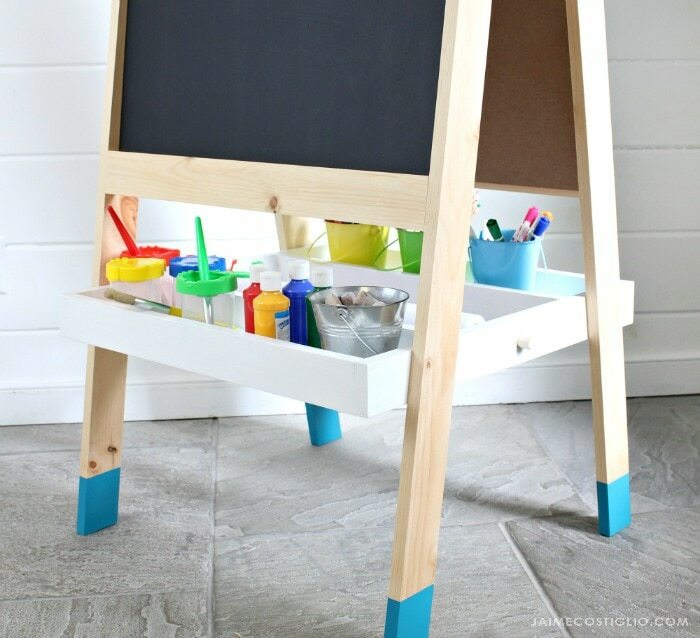 I’m considering painting some 1/4″ masonite with chalkboard paint, but am at a loss for the whiteboard panel. Great news Keith. 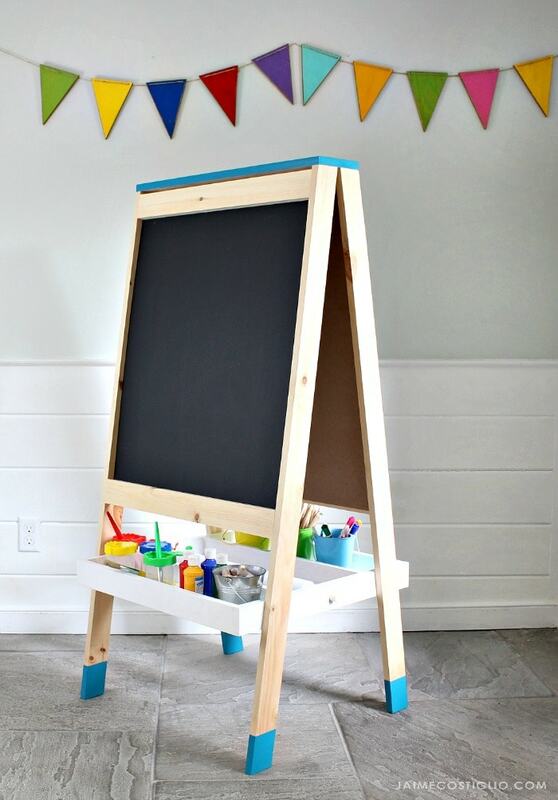 The white board and chalkboard panels are available at Home Depot in the handy panel section. Good luck with your project! What is the cost for all materials to build this? 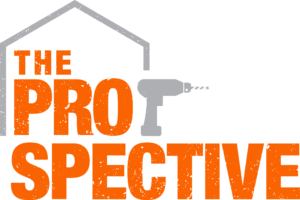 Hi Kelly, The costs for materials varies greatly depending on where you live and if you use common or select boards. It was about $50 for me in NY. 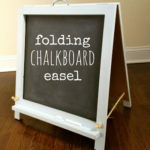 How well have the chalkboard and whiteboard panels from HD held up? Do they erase and clean off nicely? They work fine. 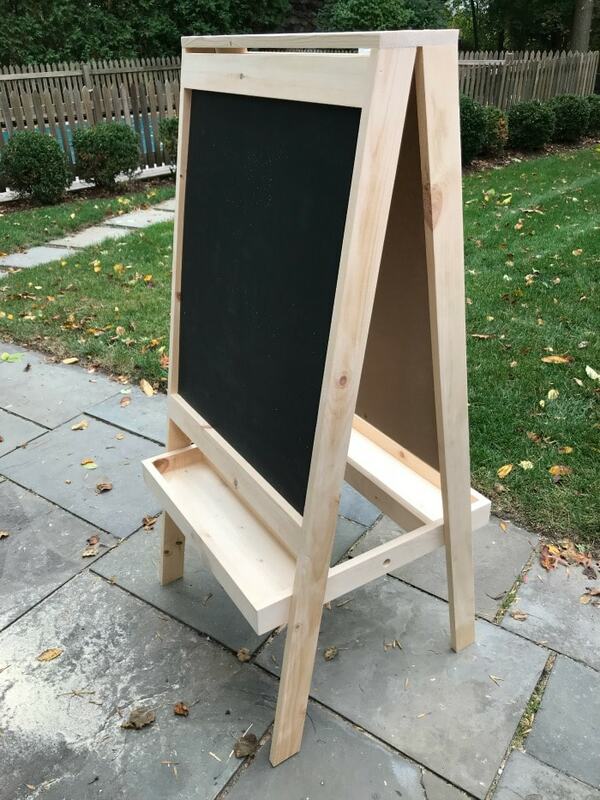 The only other experience I have is with black chalkboard painted plywood (versus the ready chalkboard panel) and I only used the ready panel here because of the plans / size. If it does eventually need to be freshen I will just paint with chalkboard paint. The whiteboard works great.